Chicken Dinner in Gravy is an excellent source of high quality protein. This grain-free dinner consists of chicken, and lots of it, providing a delicious, highly digestible diet. This recipe also includes wholesome potatoes as an exceptional source of vitamins, minerals and beta-carotene which help maintain your cat's immune system. 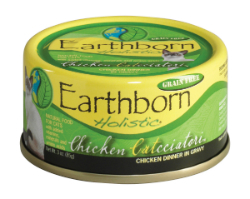 Boneless, skinless white meat chicken in a savory gravy will be sure to please your finicky cat. Chicken Catcciatori™ is 100% guaranteed for taste and nutrition. Chicken Catcciatori™ is produced in a human grade facility using many of the same ingredients and processes that are used in "people food." Feed adult cats 2 to 3 cans (3 oz. can) or 1 to 2 cans (5.5 oz can) per 4.5 pounds of body weight daily. Kittens eat up to twice as much per pound of body weight as an adult. Your cat should have access to clean, fresh water.